On Wednesday 5th November Pat McCallum invited Clare Howard and I to meet a lovely lady Sue Preston of Grimston, who accepted a cheque for £500 from Megan’s Challenge on behalf of the charity Cinnamon Trust. This wonderful charity was brought to our attention by Pat, Clare’s mum; a supporter of Megan’s Challenge and also a dedicated volunteer for The Cinnamon Trust. 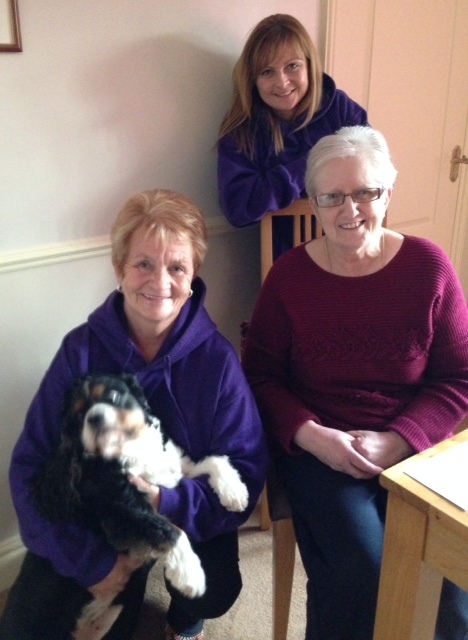 As a volunteer Pat has been regularly walking Sue’s dog Henry for the last two years. Sue told us that she only found out about the charity by searching for dog walkers on the web. Although the charity is based in Cornwall it provides a network of volunteers throughout England and Wales who “hold hands” with owners to provide vital loving care for their pets. They walk a dog every day for a housebound owner, they foster pets when owners need hospital care, fetch the cat food, or even clean out the bird cage, etc.